Learn about Tespa's premium membership service. The ultimate college gaming experience. For members, leaders, and competitors looking for a way to upgrade their Tespa experience, we’re offering a way to earn new exclusive in-game rewards, members-only merchandise, and an augmented web experience. Introducing Tespa Plus, the ultimate membership for student gamers. Upgrade now to get your hands on our custom-designed Plus merchandise and in-game rewards! We partner with developers like Blizzard and brands like Republic of Gamers to bring the digital world’s sweetest loot back to our Plus members. All in-game cosmetics included in the Tespa Plus membership are fully exclusive to Tespa Plus members. 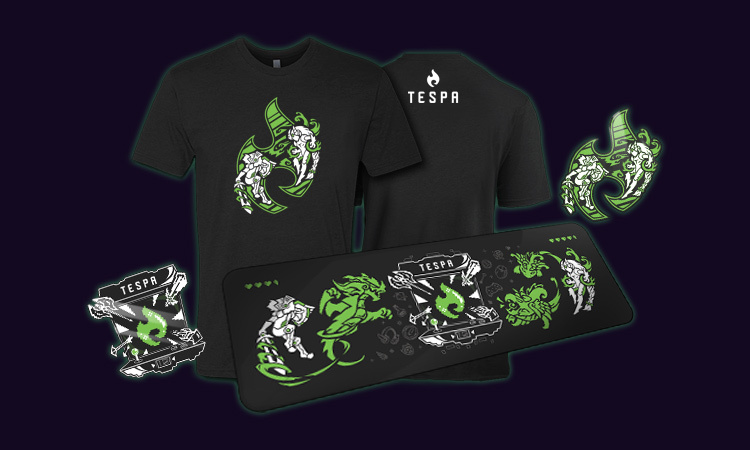 Each year, we design a custom set of Tespa gear to prepare our members for the college adventures ahead. This year, our theme is… Tespa Arcade! Inspired by bright pixels and nostalgic fighting games. Designed by Anh Nguyen. As a Tespa Plus member, you’ll automatically receive 20% bonus experience in our Member Progression system, which means you’ll earn your in-game rewards and Tespa achievements 20% faster! Unlock Tespa Plus member avatars and earn bonus EXP as you level up your character!